One of my favourite lesser known towns from this holiday is the lovely Lucca. Perfectly placed at the foot of the Apuan Alps in between both mountains and sea and a mere fifteen minute drive from Villa Cerine it oozes with tranquility and calmness. Lucca has a very special historical centre. Enclosed by its medieval, walkable walls, this characteristic makes the town quite unique. In a small way it reminded me of York, my hometown. Maybe that’s why I loved it so much. 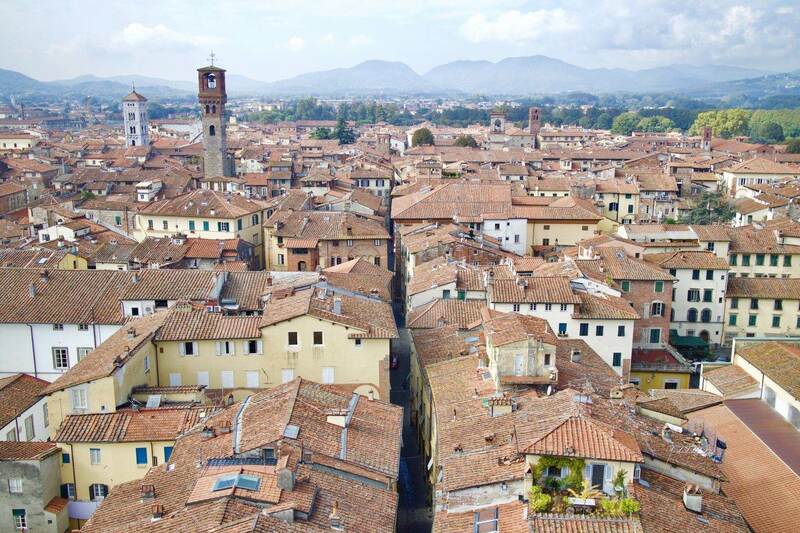 In Lucca, you’ll discover clean winding cobblestone streets, art galleries, boutique shops and churches galore. Lucca, in keeping with all Italian styles, is a mesh of effortless beauty and timelessness. Giving away its age it’s also home to an ancient 1st century A.D. Roman Amphitheater where gladiator shows were once held, but now is the home to beautiful tall houses with traditional Tuscan restaurants. We parked outside the huge impressive walls and walked in wondering what this town had to offer. We quickly discovered that climbing Guinigi Tower in the main square was possible. For for the best views climbing the 230 steps really isn’t that bad at all. Plus, in the back of my mind I’m always thinking I’ll deserve an even bigger bowl of pasta because I’ll have earned the extra calories right? Speaking of food, I’m always weary of falling into the tourist trap type of restaurants so when my brother suggested eating at the amphitheater area I was skeptical. As usual though, he was right. We adored our choice, and the name, ‘Bollicina’, which translates as ‘bubbles’. With cute checked table linen, a perfect people watching type of table and staff that were professional but friendly and nice. I couldnt resist ordering the pears and local cheese accompanied by a side bowl of honey to begin with, followed by a generous vegetarian sandwich on the side. My brother Reece had the Sea Bass. Lee ordered the Tuscan vegetable soup. Whilst my Mum, yet again, had the mixed Bruschetta. Every time! But I guess its a case of ‘you know what you like, and you like what you know’! Simple food, made well. Always enjoyable and every mouthful bursting with flavour. With the role of designated driver I was on the coffee, not a bad thing! Italian coffee is the best. Fully refreshed we wandered around more discovering unique shops and views, buying gifts and trinkets to take home. Every corner you turn you’ll discover a beautiful, Romanesque looking church — like the gorgeous Basilica of St Frediano which is the oldest church in Lucca dating back to the 6th century!! Just walking through the town will have you passing bakeries famous for their inventions (like Forne Giusti, famous for Focaccia). We cycled the famous 4.9km route atop the ancient walls. Ringing our bells and dashing under trees and around other tourists we had the best time. The views are absolutely breathtaking, almost like something straight out of a storybook. Eventually, Villa Cerine was calling us back and we headed on home hungry again and ready for our evening supper to be cooked by our own private chef. Not as extravagant as it sounds, the villa team offer it as a extra service! We were all intrigued as to what we’d be having and after a long day sightseeing with achey feet it leaves some time to relax and get ready. Currently the days have been surprisingly warm, the locals have said we’ve been lucky for October. Night times require a jacket or scarf but it’s still warm enough to eat outside on the terrace. We were utterly spoiled and dined on some of the local specialities. Fresh salad with edible flowers, drizzled with local oils and balsamic. The juiciest of blackberries on little slices of traditional bread slathered in the creamiest of local cheeses. All washed down with strawberries and Prosecco. Exhausted and ready to drop we eventually all disappeared to our rooms dreaming of how the next day of adventures could beat this one. Don’t forgot, if you visit the Clickstay website and book a holiday for yourself, enter HelloCuppies at the checkout for a £50 discount off of a booking of £500 or more! "(AD) Arriving in Altopascio, Tuscany"
This looks like a fabulous trip! The architecture is gorgeous and you found some yummy-looking restaurants. Those berry tarts are so pretty. I love trying new foods when I travel. It looks like a great and beautiful place to visit. The food sounds so delicious and tempting. I am pretty sure that you really enjoyed your trip there at Villa Cerine. I will definitely put this on my bucket list for my next travel visit. Wow!! This is such a great place to visit. and that restaurant has a lot of delicious foods. Looks like you really enjoy visiting that place. Woo! Look at these pictures. Lucca looks like a lovely place to visit. The buildings are so beautiful and the food looks great. Is this still part of you Altopascio, Tuscany trip….Because you really are convincing me that Italy should be our prime location. 230 steps isn’t so bad we have a trail here called 1000 steps which takes you up to a grand view, so I think we could handle 230. I thoughts so, The Villa’s name sounded way to familiar.I look forward to seeing those post. I don’t speak a lick of Italian, would I still be able to manage there. And those pictures that came up on google for Cinque Terre how picture perfect do they look. Wow!! I enjoy seeing those foods looks so delicious/ It makes me really hungry. I will definitely check this place so interesting. Gosh, I LOVE Lucca! I visited back in 2009 and your photos have brought back so many memories. I love discovering hidden gems and I really feel like Lucca is one of those places, don’t you think! Ooh yay! You’ve been too & totally know what I’m talking about! The food was incredible, I also learnt the town only allows genuine Italian restaurants to set up too, no international cuisine allowed!